Democrats won an election wave of historic proportions on Nov. 6 — with their largest gains in the House of Representatives since Watergate and the most diverse freshman class ever—amidst a fog of denialism that initially flooded the pundit class. But the Democrats’ recapture of the House was assured even before polls closed in California, where 15-term GOP conspiracy theorist Dana Rohrabacher was eventually defeated (see “Blue Wave Hits Orange County—Hard,” p 10). Recapturing the House signaled the end to congressional collusion with Trump’s attacks on American democracy — at least on the House side—as well as the potential to advance a popular progressive agenda: raising the federal minimum wage to $15, strengthening the Affordable Care Act, passing a massive public infrastructure bill, granting legal status to immigrant children known as “dreamers” and reauthorizing the Voting Rights Act. This was all backed up by sweeping state-level victories, a flurry of progressive initiatives and historic levels of voter participation driven by waves of newly-engaged activists. Three compelling high-level progressive candidates who appeared to fall short—Beto O’Rourke, Stacey Abrams and Andrew Gillum—nonetheless showed that it wasn’t necessary to run defensively as GOP-lite candidates in traditionally conservative states, and did tremendous party-building work for the future. “Turnout is crucial, and progressive candidates often propelled it,” progressive activist and author Norman Solomon told Random Lengths News. “Even when dynamic statewide campaigns didn’t win — as in races for governor in Georgia and Florida or for U.S. Senate in Texas — grassroots momentum brought in voters who arguably tipped the balance in numerous down-ballot races. The diversity of candidates was also noteworthy, finally starting to reflect the diversity of the progressive voter base. 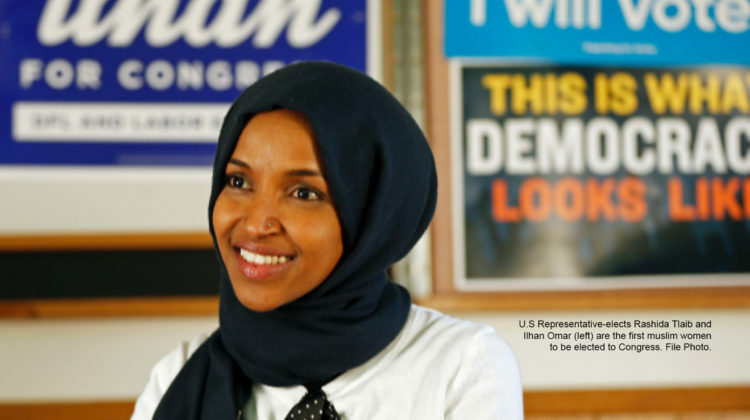 Rashida Tlaib, and Ilhan Omar, an American-raised, Somali-born refugee, became the first of two Muslim congresswomen. Deb Haaland and Sharice Davids (a lesbian and mixed martial arts fighter with an Ivy League law degree from Cornell) became the first Native American congresswomen. Jahana Hayes, 2016 National Teacher of the Year and Ayanna Pressley were the first black congresswomen from New England — Hayes from Connecticut, Pressley from Massachusetts. Veronica Escobar and Sylvia Garcia became the first Hispanic congresswomen from Texas. At the state level, Democrats won sweeping victories, flipping eight governorships, six state legislative chambers, and more than 300 state House and Senate seats. They gained unified control of the governor’s office and legislature in eight states, more than doubling their previous total of just six. In addition to changing the direction of state-level governance, this bodes well as a first step toward preventing a repeat of the systemic gerrymandering Republicans pulled off after the 2010 census. Democrats also won a majority of attorneys general seats. And similar gains trickled down to the local level. For example, 65 percent of candidates endorsed by the Democratic Party of Orange County won, according to DPOC spokesperson Rachel Potucek. “That’s a significant accomplishment,” including a lot firsts, Potucek told Random Lengths News. There were also significant victories for progressive initiatives — expanding Medicaid, raising the minimum wage, legalizing marijuana, expanding voting rights, and protecting against gerrymandering. Florida’s Amendment 4 restored voting rights for 1.4 million felons who had served their full sentences, representing roughly 10 percent of the state’s electorate. But behind it all was a tremendous increase in voter participation, hitting a 104-year high in midterm turnout, with near presidential-year levels in most places. Youth turnout was up more than 50 percent from 2014, though still well below average at 31 percent. And that, in turn, was partly driven by an enormous increase in activism. Swing Left, a group which focused on the flipping the House, mobilized 150,000 volunteers (either doing voter contact or fundraising), 40 percent of whom had never been involved in a campaign before. “Taking back the House is a testament to the unprecedented power of the grassroots effort led by the thousands of volunteers who channeled their energy into meaningful action,” Swing Left co-founder Ethan Todras Whitehill said. “In response to Trump and the Republican agenda, progressives did more than just protest and march, they also spent the last two years organizing and volunteering to get out the vote in critical swing districts. That is how we won,” he said. “There were people all over Chicago looking for this kind of way to make a difference,” said Connie Meyer, a co-leader of Northside Chicago Swing Left, which formed in February 2017 and helped unseat six-term representative Peter Roskam, who’d never gotten less than 59 percent defending his suburban seat. Barbara Kent was a Swing Left co-leader in NY 11, covering Staten Island and parts of Brooklyn. Staten Island had only had one Democratic representative she could remember. When Swing Left considered adding the district to its list, “I told them it would be (the) hardest race to win, but it could be done,” she said. She was right. It was the first “Rep favored” seat to go blue on the New York Time’s House Election List of 80 races. But it doesn’t take a megalopolis. In Kansas 3, where Sharice Davids won, Alan Sunkel and his wife read about Swing Left in the New Yorker in January 2017, and helped start the group there. “We had a pretty committed group of volunteers here who formed the steering committee,” he said. Plus, they had support from outside the district, just across the river in Missouri. Meanwhile, back in the real world, voters passed a number of initiatives that underscored how significantly pragmatic bipartisan support equates with so-called “hard left” policy ideas that progressives have been pushing for years, if not decades. Three deep-red states – Idaho, Nebraska, and Utah – voted for Medicaid expansion; two other red states – Arkansas and Missouri – substantially raised the minimum wage; and two of the five – Utah and Missouri – voted to legalize medical marijuana, while Michigan fully legalized marijuana. Massachusetts passed transgender anti-discrimination protections – the first in the nation – while Washington state tightened gun control laws. On voting-rights, Florida passed the historic Amendment 4, restoring the voting rights of convicted felons who have completed the full terms of their sentences. A whopping 1.4 million Floridians had their voting rights restored. Nevada and Michigan passed automatic voter registration laws, bringing the total to 15 states, plus Washington, D.C., Maryland and Michigan both passed same-day registration. And the voters of Colorado, Michigan, Missouri, and Utah passed anti-gerrymandering initiatives, removing politicians from drawing their own districts.